MIAMI -- Democrat Hillary Clinton and Republican Donald Trump, emboldened by commanding victories Tuesday across large swaths of the country, are beginning to focus on each other in the race for the White House. Clinton previewed a "love and kindness" message while Trump traded his typical rollicking rallies for a sober media conference where he pressed his case that Clinton is a proven failure as a longtime politician. Both spoke from Florida, where the general election is often won or lost. That wasn't one of the dozen states that weighed in on a day known as Super Tuesday because it's the busiest of the 2016 primary season. Texas Sen. Ted Cruz won his home state, Oklahoma and Alaska, buttressing his out-of-the-gate win in the Iowa caucuses a month ago, while Florida Sen. Marco Rubio notched his first victory, in Minnesota. "Our campaign is the only campaign that has beaten, that can beat, and that will beat Donald Trump," Cruz thundered to supporters gathered at the wood-paneled Redneck Country Club in Stafford, Texas. Still, he'd been counting on more appeal in the Southern states and among evangelical Christian voters. Trump, who dubs his surging campaign the "Trump Train," has derailed those plans. Rubio and the other Republicans still in the race, John Kasich and Ben Carson, struggled Tuesday to convey optimism even as they vowed to fight on. Simple math reinforces a bind for the Republicans who reject Trump, as the brash billionaire businessman carried seven states and continues to barrel toward the 1,237 delegates needed to secure the GOP nomination. Trump won at least 203 delegates Tuesday. Cruz collected at least 144 delegates and Rubio picked up at least 71. Overall, Trump leads with 285 delegates, Cruz has 161, Rubio has 87, Kasich has 25 and Carson has eight. It takes 1,237 delegates to win the GOP nomination. Increasingly, leading Republicans talk of a contested convention in July as their best remaining option for stopping Trump, whose divisive rhetoric about immigrants and ethnic and religious groups has some fearing a GOP wipeout in November. Like Cruz, Vermont Sen. Bernie Sanders was victorious in his home state. He also picked up victories in Oklahoma, Minnesota and Colorado, and he assured supporters he'd take his fight to "every one" of the remaining contests. With a staggering $42 million raised in February alone, Sanders has the campaign cash to do just that — though Clinton is well on her way to the 2,383 delegates needed on the Democratic side. Tuesday's results left little doubt as to the front-runners in the race. Clinton collected wins in seven states, and Trump swept up victories in seven, including Virginia, another important general election battleground. She is assured of winning at least 457 of the 865 delegates at stake Tuesday. Sanders will gain at least 286. When including party leaders, Clinton has at least 1,005 delegates and Sanders has at least 373. 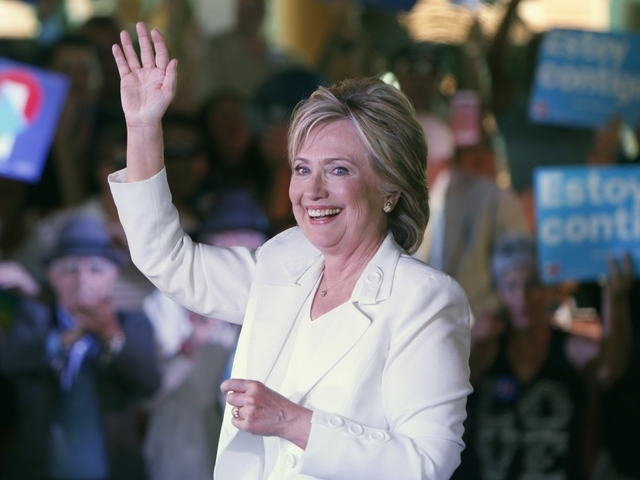 Clinton held on to older voters and strongly prevailed among Hispanics and African-Americans, according to exit polls conducted for The Associated Press and television networks by Edison Research. Trump, a political newcomer, pulled in two-thirds of voters looking to install an outsider in the White House, while GOP voters seeking an experienced candidate were split between Rubio and Cruz, both first-term senators. Speaking from his gold-flecked Mar-a-Lago resort, Trump asserted that his candidacy is a "movement" and that he is expanding the Republican Party even as many of its leaders have distanced themselves from him. A moment after Trump professed to have good relationships with his party's elite, he issued a warning to House Speaker Paul Ryan, who had declared earlier Tuesday that "this party does not prey on people's prejudices." Trump said that if the two don't get along, Ryan is "going to have to pay a big price." One way Trump claimed he would unify the party was by training his fire on Clinton. He said she should be disqualified from even running for office because she broke from government protocol by using a private email server while she was secretary of state. Clinton tried to turn Trump's "Make America Great Again" slogan on its head, saying the country instead must be made "whole again." "What we need in America today is more love and kindness," she said. "Instead of building walls, we're going to break down barriers and build ladders of opportunity and empowerment." Trump ridiculed her comments. "She's been there for so long," he said. "If she hasn't straightened it out by now, she's not going to straighten it out in the next four years." 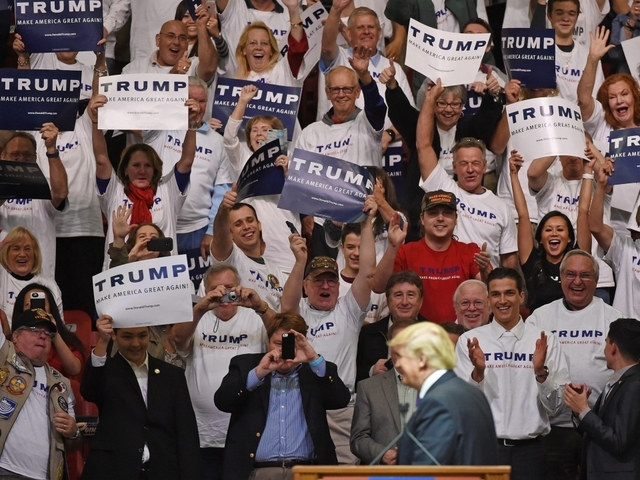 Rubio said his supporters would never rally around Trump. He and Kasich showed little sign of relenting, especially with their home states of Florida and Ohio voting on March 15. "We are so excited about what lies ahead for our campaign," Rubio said at his Tuesday night rally in Miami, his hometown. "You see, just five days ago we began to unmask the true nature of the front-runner in this race." He portrayed his attacks on Trump as having an impact already, though that wasn't evident in Super Tuesday's results.